The city of the frog men! Really, how could I resist that teaser? As astounding as that teaser is, there is a serious reason for presenting the novella The Second Satellite by the legendary science fiction writer EDMOND HAMILTON (1904-1977) from the August 1930 edition of Astounding Stories of Super Science. This story eerily anticipates two of the 1970s' most important ancient astronaut books. Hamilton's "second satellite"--a miniature world orbiting around the earth--is a dead ringer for Zecharia Sitchin's Nibiru, the wandering planet of his ancient astronauts, who also are sometimes said to have fed on human blood. And the frog-vampires bear an uncanny resemblence to Robert Temple's flying space frogs from Sirius. Surely this ia a coincidence, but given the well-documented cross-polination of "alternative" science and science fiction, especially in the ancient astronaut theory, the sheer number of these coincidences become somewhat more suspect. "I don't know which of you two is crazier," he said. "You, Norman, to propose a fool trip like this, or you, Hackett, to go with him." Hackett grinned, but the long, lean face of Norman was earnest. "No doubt it all sounds a little insane," he said, "but I'm convinced I'm right." The field superintendent shook his head. "Norman, you ought to be writing fiction instead of flying. A second satellite—and Fellows and the others on it—what the devil!" "What other theory can account for their disappearance?" asked Norman calmly. "You know that since the new X-type planes were introduced, hundreds of fliers all over Earth have been trying for altitude records in them. Twenty-five miles—thirty—thirty-five—the records have been broken every day. But out of the hundreds of fliers who have gone up to those immense heights, four have never come down nor been seen again! "One vanished over northern Sweden, one over Australia, one over Lower California, and one, Fellows, himself, right here over Long Island. You saw the globe on which I marked those four spots, and you saw that when connected they formed a perfect circle around the Earth. The only explanation is that the four fliers when they reached a forty-mile height were caught up by some body moving round Earth in that circular orbit, some unknown moon circling Earth inside its atmosphere, a second satellite of Earth's whose existence has until now never been suspected!" Harding shook his head again. "Norman, your theory would be all right if it were not for the cold fact that no such satellite has ever been glimpsed." "Can you glimpse a bullet passing you?" Norman retorted. "The two fliers at Sweden and Lower California vanished within three hours of each other, on opposite sides of the Earth. That means that this second satellite, as I've computed, circles Earth once every six hours, and travelling at that terrific speed it is no more visible to us of Earth than a rifle bullet would be." "Moving through Earth's atmosphere at such speed, indeed, one would expect it to burn up by its own friction with the air. But it does not, because its own gravitational power would draw to itself enough air to make a dense little atmosphere for itself that would cling to it and shield it as it speeds through Earth's upper air. No, I'm certain that this second satellite exists, Harding, and I'm as certain that it's responsible for the vanishing of those four fliers." "And now you and Hackett have figured when it will be passing over here and are going up in an X-type yourselves to look for it," Harding said musingly. "Look for it?" echoed Hackett. "We're not going to climb forty miles just to get a look at the damn thing—we're going to try landing on it!" "You're crazy sure!" the field superintendent exploded. "If Fellows and those others got caught by the thing and never came down again, why in the name of all that's holy would you two want—" He stopped suddenly. "Oh, I think I see," he said, awkwardly. "Fellows was rather a buddy of you two, wasn't he?" "The best that ever flew a crippled Nieuport against three Fokkers to pull us out of a hole," said Norman softly. "Weeks he's been gone, and if it had been Hackett and I he'd be all over the sky looking for us—the damned lunatic. Well, we're not going to let him down." "I see," Harding repeated. Then—"Well, here comes your mechanic, Norman, so your ship must be ready. I'll go with you. It's an event to see two Columbuses starting for another world." The gray dawn-light over the flying field was flushing to faint rose as the three strode out to where the long X-type stood, its strangely curved wings, enclosed cabin and flat, fan-like tail gleaming dully. Its motor was already roaring with power and the plane's stubby wheels strained against the chocks. In their great suits Norman and Hackett were like two immense ape-figures in the uncertain light, to the eyes of those about them. "Well, all the luck," Harding told them. "You know I'm pulling for you, but—I suppose it's useless to say anything about being careful." "I seem to have heard the words," Hackett grinned, as he and Norman shook the field superintendent's hand. "It's all the craziest chance," Norman told the other. "And if we don't come down in a reasonable time—well, you'll know that our theory was right, andyou can broadcast it or not as you please." "I hope for your sake that you're dead wrong," smiled the official. "I've told you two to get off the Earth a lot of times, but I never meant it seriously." Harding stepped back as the two clambered laboriously into the cramped cabin. Norman took the controls, the door slammed, and as the chocks were jerked back and the motor roared louder the long plane curved up at a dizzy angle from the field into the dawn. Hackett waved a thick arm down toward the diminishing figures on the field below; then turned from the window to peer ahead with his companion. The plane flew in a narrow ascending spiral upward, at an angle that would have been impossible to any ship save an X-type. Norman's eyes roved steadily over the instrument as they rose, his ears unconsciously alert for each explosion of the motor. Earth receded swiftly into a great gray concave surface as they climbed higher and higher. By the time the five-mile height was reached Earth's surface had changed definitely from concave to convex. The plane was ascending by then in a somewhat wider spiral, but its climb was as steady and sure as ever. Frost begin to form quickly on the cabin's windows, creeping out from the edges. Norman spoke a word over the motor's muffled thunder, and Hackett snicked on the electrical radiators. The frost crept back as their warm, clean heat flooded the cabin. After a time Norman pointed mutely to the clock on the instrument board, and Hackett nodded. They were well within their time schedule, having calculated to reach the forty-mile height at ten, the hour when, by its computed orbit, the second satellite should be passing overhead. "—26—27—28—" Hackett muttered the altimeter figures to himself as the needle crept over them. Glancing obliquely down through the window he saw that Earth was now a huge gray ball beneath them, white cloud-oceans obscuring the drab details of its surface here and there. "—31—32—" The plane was climbing more slowly, and at a lesser angle. Even the X-type had to struggle to rise in the attenuated air now about them. Only the super-light, super-powered plane could ever have reached the terrific height. It was at the thirty-four mile level that the real battle for altitude began. Norman kept the plane curving steadily upward, handling it with surpassing skill in the rarefied air. Frost was on its windows now despite the heating mechanism. Slowly the altimeter needle crept to the forty mark. Norman kept the ship circling, its wings tilted slightly, but not climbing, Earth a great gray misty ball beneath. "Can't keep this height long," he jerked. "If our second satellite doesn't show up in minutes we've had a trip for nothing." "All seems mighty different up here," was Hackett's shouted comment. "Easy enough to talk down there about hopping onto the thing, but up here—hell, there's nothing but air and mighty little of that!" Norman grinned. "There'll be more. If I'm right about this thing we won't need to hop it—its own atmosphere will pick us up." Both looked anxious as the motor sputtered briefly. But in a moment it was again roaring steadily. Norman shook his head. "Maybe a fool's errand after all. No—I'm still sure we're right! But it seems that we don't prove it this time." "We'll have to, in minutes. Even with its own air-feed the motor can't stand this height for—"
Norman never finished the words. There was a sound, a keen rising, rushing sound of immense power that reached their ears over the motor's roar. Then in an instant the universe seemed to go mad about them: they saw the gray ball of Earth and the sun above skyrocketing around them as the plane whirled madly. The rushing sound was in that moment thunderous, terrible, and as winds smashed and rocked the plane like giant hands, Hackett glimpsed another sphere that was not the sphere of Earth, a greenish globe that expanded with lightning speed in the firmament beside their spinning plane! The winds stilled; the green globe changed abruptly to a landscape of green land and sea toward which the plane was falling! Norman was fighting the controls—land and sea were gyrating up to them with dizzy speed—crash! With that cracking crash the plane was motionless. Sunlight poured through its windows, and great green growths were all around it. Hackett, despite Norman's warning cry, forced the door open and was bursting outside, Norman after him. They staggered and fell, with curious lightness and slowness, on the ground outside, then clutched the plane for support and gazed stupefiedly around them. The plane had crashed down into a thicket of giant green reeds that rose a yard over their heads, its pancake landing having apparently not damaged it. The ground beneath their feet was soft and soggy, the air warm and balmy, and the giant reeds hid all the surrounding landscape from view. In the sky the sun burned near one horizon with unusual brilliance. But it was dwarfed, in size, by the huge gray circle that filled half the heavens overhead. A giant gray sphere it was, screened here and there by floating white mists and clouds, that had yet plain on it the outlines of dark continents and gleaming seas. A quaking realization held the two as they stared up at it. “Earth!" Norman was babbling. "It's Earth, Hackett—above us; my God, I can't believe even yet that we've done it!" "Then we're on—the satellite—the second satellite!—" Hackett fought for reality. "Those winds that caught us—"
"They were the atmosphere of this world, of the second satellite! They caught us and carried us on inside this smaller world's atmosphere, Hackett. We're moving with it around Earth at terrific speed now!" "The second satellite, and we on it!" Hackett whispered, incredulously. "But these reeds—it can't all be like this—"
They stepped together away from the plane. The effort sent each of them sailing upward in a great, slow leap, to float down more than a score of feet from the plane. But unheeding in their eagerness this strange effect of the satellite's lesser gravitational power, they moved on, each step a giant, clumsy leap. Four such steps took them out of the towering reeds onto clear ground. It was a gentle, grassy slope they were on, stretching away along a gray-green sea that extended out to the astoundingly near horizon on their right. To the left it rose into low hills covered with dense masses of green junglelike vegetation. Hackett and Norman, though, gazed neither at sea or hills for the moment, but at the half-score grotesque figures who had turned toward them as they emerged from the reeds. A sick sense of the unreal held them as they gazed, frozen with horror. For the great figures returning their gaze a few yards from them were—frog-men! Frog-men! Great mottled green shapes seven to eight feet in height, with bowed, powerful legs and arms that ended in webbed paws. The heads were bulbous ones in which wide, unwinking frog-eyes were set at the sides, the mouths white-lipped and white-lined. Three of the creatures held each a black metal tube-and-handle oddly like a target-pistol. "Norman!" Hackett's voice was a crescendo of horror. "Norman!" "Back to the plane!" Norman cried thickly. "The plane—"
The two staggered back, but the frog-men, recovering from their own first surprise, were running forward with great hopping steps! The two fliers flung themselves back in a floating leap toward the reeds, but the green monsters were quick after them. A croaking cry came from one and as another raised his tube-and-handle, something flicked from it that burst close beside Norman. There was no sound or light as it burst, but the reeds for a few feet around it vanished! A hoarse cry from Hackett—the creatures had reached him, grasped him at the edge of the reeds! Norman swerved in his floating leap to strike the struggling flier and frog-men. The scene whirled around him as he fought them, great paws reaching for him. With a sick, frantic rage he felt his clenched fist drive against cold, green, billowy bodies. Croaking cries sounded in his ears; then, Hackett and he were jerked to their feet, held tightly by four of the creatures. "My God, Norman," panted Hackett, helpless. "What are they—frog-things?—"
"Steady, Hackett. They're the people of the second satellite, it seems; wait!" One of the armed frog-men approached and inspected them, and then croaked an order in a deep voice. Then, still holding the two tightly, the party of monsters began to move along the slope, skirting the sea's edge. In a few minutes they reached two curious objects resting on the slope. They seemed long black metal boats, slender and with sharp prow and stern. A compact mechanism and control-board filled the prow, while at the stern and sides were long tubes mounted on swivels like machine-guns. The frog-men motioned Norman and Hackett into one, fastening the two prisoners and themselves into their seats with metal straps provided for the purpose. Four had entered the one boat, the others that of the captives. One at the prow moved his paws over the control-board and with a purring of power the boat, followed by the other, rose smoothly into the air. It headed out over the gray-green sea, land dropping quickly from sight behind, the horizons water-bounded on all sides. From their nearness Norman guessed that this second satellite of Earth's was small indeed beside its mother planet. He had to look up to earth's great gray sphere overhead to attain a sense of reality. Hackett was whispering beside him, the frog-men watchful. "Norman, it's not real—it can't be real! These things—these boats—intelligent like men—"
The other sought to steady him. "It's a different world, Hackett. Gravitation different, light different, everything different, and evolution here has had a different course. On Earth men evolved to be the most intelligent life-forms, but here the frog-races, it seems." "But where are they taking us? Could we ever find the plane again?" "God knows. If we ever get away from these things we might. And we've got to find Fellows, too; I wonder where he is on this world." For many minutes the two boats raced on at great speed over the endless waters before the watery skyline was broken far ahead by something dark and unmoving. Hackett and Norman peered with intense interest toward it. It seemed at first a giant squat mountain rising from the sea, but as they shot nearer they saw that its outline was too regular, and that colossal as it was in size it was the work ofintelligence. They gasped as they came nearer and got a better view of it. For it was a gigantic dome of black metal rising sheer from the lonely sea, ten miles if anything in diameter, a third that in greatest height. There was no gate or window or opening of any kind in it. Just the colossal, smooth black dome rearing from the watery plain. Yet the two boats were flashing lower toward it. "They can't be going inside!" Hackett conjectured. "There's no way in and what could be in there? The whole thing's mad—"
"There's some way," Norman said. "They're slowing—"
The flying-boats were indeed slowing as they dipped lower. They were very near the dome now, its curving wall a looming, sky-high barrier before them. Suddenly the boats dipped sharply downward toward the green sea. Before the two fliers could comprehend their purpose, could do aught more than draw instinctive great breaths in preparation, the two craft had shot down into the waters and were arrowing down through the green depths. Blinded, flung against his metal strap by the resistance of the waters they ripped through, Norman yet retained enough of consciousness to glimpse beams of light that stabbed ahead from the prows of their rushing boats, to see vaguely strange creatures of the deep blundering in and out of those beams as the boats hurtled forward. The water that forced its way between his lips was fresh, he was vaguely aware, and even as he fought to hold his breath was aware too that the frog-men seemed in no way incommoded by the sudden transition into the water, their amphibian nature allowing them to stay under it far longer than any human could do. The boats ripped through the waters at terrific speed and in a few seconds there loomed before them the giant metal wall of the great dome, going down into the depths here. Norman glimpsed vaguely that the whole colossal dome rested on a vast pedestal-like mountain of rock that rose from the sea's floor almost to the surface. Then a great round opening in the wall; the boats flashed into it and were hurtling along a water-filled tunnel. Norman felt his lungs near bursting—when the tunnel turned sharply upward and the boats whizzed up and abruptly out of the water-tunnel into air! But it was not the open air again. They were beneath the gigantic dome! For as Norman and Hackett breathed deep, awe fell on their faces as they took in the scene. Far overhead stretched the dome's colossally curving roof, and far out on all sides. It was lit beneath that roof by a clear light that the two would have sworn was sunlight. The dome was in effect the roof of a gigantic, illuminated building, and upon its floor there stretched a mighty city. The city of the frog-men! Their boats were rising up over it and Norman and Hackett saw it clear. Square mile upon square mile of structures stretched beneath the dome, black buildings often of immense size, varying in shape, but all of square, rectangular proportions. Between them moved countless frog-hordes, swirling throngs in streets and squares, and over the roofs darted thick swarms of flying-boats. And at the city's center, in a great, circular, clear space, lay a wide, round, green pool—the opening of the water-tunnel up through which they had come. Norman pointed down toward it. "That's your answer!" he cried. "The only entrance to this frog-city is from the sea, up through that water-tunnel!" "Good God, an amphibian city!" Hackett was shaken, white-faced. The two boats were driving quickly over the city, through the swarming craft. Norman glimpsed towering buildings that might have been palaces, temples, laboratories. They slowed and dipped toward one block-like building not far from the water-tunnel's opening. Armed frog-guards were on its roof, and other boats rested there. The two came to rest and the two captives were jerked out, the guards seizing them. Half-dragged and half-floating they were led toward an opening in the roof from which a stair led downward. They passed down thus into the building's interior, lit by many windows. Norman glimpsed long halls ending in barred doors, guards here and there. Tube-lines ran along the walls and somewhere machines were throbbing dully. They came at last to a barred door whose guard opened it at the croaking order of the frog-men who held the two, and they were thrust inside, as the door clanged. They turned, and exclaimed in amazement. The room held fully a half-hundred men! They were men such as the two fliers had never seen before, like humans except that their skins were a light green instead of the normal white and pink. They were dressed in dark short tunics, and kept talking to each other in a tongue quite unintelligible to Norman and Hackett. They came closer, flocking curiously around the two men, with a babel of voices quite meaningless to the two. Then one of the men uttered an exclamation, and all turned. The barred door had swung open and a half-dozen frog-guards entered, followed by two frog-men carrying a square little mechanism from which tubing led back out through the door. "Norman—these men—" Hackett was whispering rapidly. "If there are men in this world too, it may be that—"
"Quiet, Hackett—look at what they're doing." The two frog-men had set their mechanism in place and then croaked out a brief word or order. Slowly, reluctantly, one of the green men moved toward them. Quickly they removed a metal disk fastened to his arm, exposing a small orifice like an unhealed wound. Onto this they fastened a suckerlike object from which a transparent tube led back through the mechanism. The machine hummed and at once a red stream pulsed through the tube and back through the mechanism. The man to whom it was attached was growing rapidly pale! Norman, sick with horror, clutched his companion. "Hackett—these frog-men are sucking his blood from him!" "Good God! And look—they're doing it with another!" "All of these men—kept prisoners to furnish them with blood. It must be the damned creatures' food! And we here with the others—"
A common horror shook the two. It did not seem to affect the green men in the room, though, who advanced to the mechanism one by one with a reluctant air as of cows unwilling to be milked. Each was attached to the mechanism by the sucking disk on his arm, and out of each the blood poured through the tube. The metal disk was replaced on his arm then and he went back to the others. Norman saw that the frog-men took only from each an amount of blood that they could lose and yet live, since, though each came back pale and weak from the mechanism, they were able to walk. "It must be their food—human blood!" Norman repeated. "They may have thousands on thousands of humans penned up like this, like so many herds of cows, and perhaps they live entirely on the life-blood they milk from them. Human cows—God!" The two stiffened. All the others in the room had taken their turn at the blood-sucking mechanism and now the frog-men croaked their order to the two fliers. They had forgotten their own predicament in the horror of the scene, but now it became real to them. They backed against the room's wall, quivering, dangerous. The frog-guards came forward to drag them to the machine. A webbed paw was outstretched but Hackett with a wild blow drove the frog-man back and downward. The frog-guards leaped, and Norman and Hackett struck them back with all the greater strength the lesser gravitation gave them. The room was in an uproar, the green men shouting hoarsely and seeming on the point of rushing to their aid. But the menacing force-pistols of the other frog-guards held back the shouting men and in moments the two fliers were overpowered by sheer weight of frog-bodies. Norman felt himself dragged to the machine. Pain needled his upper arm as an incision was made. He felt the sucking-disk attached; then the machine hummed, and a sickening nausea swept him as the blood drained from his body. Held tightly by the guards he went dizzy, weak, but at last felt the sucker removed and a metal disk fastened over the incision. He was jerked aside and Hackett, his face deathly white, was dragged into his place. In a moment some of the latter's blood had been pumped from him also. The machine was withdrawn, Norman and Hackett were released, and the frog-men, with their black force-pistols watchfully raised, withdrew, the door clanging. The room settled back to quietness, the green men stretching in lassitude on the metal bunks around it. The two fliers crouched down near the door, shuddering nausea and weakness still holding them. Norman found that Hackett was laughing weakly. "To think that twenty-four hours ago I was in New York," he half-laughed, half-sobbed. "On Earth—Earth—"
The other gripped his arm. "It's horrible, Hackett, I know. But it isn't instant death, and we've still a chance to escape. Hell, can damn frog-men keep us here? Where's your nerve, man?" A voice beside them made them turn in amazement. "You are men from Earth?" it asked, in queerly accented English. "From Earth?" Astonishment held them as they saw who spoke. It was one of the green men in the room, who had settled down by their side. A tall figure with superb muscles and frank, clean countenance, his dark eyes afire with eagerness. "English?" Norman exclaimed. "You know English—you understand me?" The other showed his teeth in a smile. "I know, yes. I'm Sarja, and I learned to speak it from Fallas, in my city, before the Ralas caught me." "Fallas—" Norman repeated, puzzled; then suddenly he flamed. "By God, he means Fellows!" "Fallas, yes," said the other. "From the sky he fell into our city in a strange flying-boat that was smashed. He was hurt but we cared for him, and he taught me his speech, which I heard you talking now." "Then Fellows is in your city now?" asked Hackett eagerly. "Where is that?" "Across this sea—back in the hills," the other waved. "It is far from the sea but I was rash one day and came too near the water in my flying-boat. The Ralas were out raiding and they saw me, caught me, and brought me here. No escape now, until I die." "The Ralas—you mean these frog-men?" Norman asked. Sarja nodded. "Of course. They are the tyrants and oppressors of this world. Our little world is but a tenth or less the size of your great Earth which it circles, but it has its lands and rivers, and this one great fresh-water sea into which the latter empty. In this sea long ago developed the Ralas, the great frog-men who acquired such intelligence and arts that they became lords of this world. "Through the centuries, while on the land our races of green men have been struggling upward, the Ralas have oppressed them. Long ago the Ralas left all their other cities to build this one great amphibian city at the sea's center. Entrance to it is only by the water-tunnel from without, and being frog-people entrance thus is easy for them since they can move for many minutes under water, though they drown like any other breathing animal if kept under too long. Humans dare not try to enter it thus by the water-tunnel, since, before they could find it and make their way up through it, they would have drowned. So the Ralas have ruled from this impregnable amphibian city. Its colossal metal dome is invulnerable to ordinary attack, and though solid and without openings it is always as light beneath the dome here as outside, since the Ralas' scientists contrived light-condensers and conductors that catch light outside and bring it in to release inside. So when it is day outside the sunlight is as bright here, and when night comes the Earth-light shines here the same as without. "From this city their raiding parties have gone out endlessly to swoop down on the cities of us green men. Since we learned to make flying-boats like theirs, with molecular-motors, and to make the guns like theirs that fire shells filled with annihilating force, we have resisted them stoutly but their raids have not ceased. And always they have brought their prisoners back in to this, their city. "Tens of thousands of green men they have prisoned here like us, for the sole purpose of supplying them with blood. For the Ralas live on this blood alone, changing it chemically to fit their own bodies and then taking it into their bodies. It eliminates all necessity for food here for them. Every few days they drain blood from us, and since we are well fed and cared for to keep us good blood-producers, we will be here for a long time before we die." "But haven't you made any attempt to get out of here—to escape?" Norman asked. Sarja smiled. "Who could escape the city of the Ralas? In all recorded history it has never been done, for even if by some miracle you got a flying-boat, the opening of the water-tunnel that leads outward is guarded always." "Guards or no guards, we're going to try it and not sit here to furnish blood for the Ralas," Norman declared. "Are you willing to help, to try to get to Fellows and your city?" The green man considered. "It is hopeless," he said, "but as well to die beneath the force-shells of the Ralas as live out a lifetime here. Yes, I will help, though I cannot see how you expect to escape even from this room." "I think we can manage that," Norman told him. "But first—not a word to these others. We can't hope to escape with them all, and there is no knowing what one might not betray us to the frog-men." He went on then to outline to the other two the idea that had come to him. Both exclaimed at the simpleness of the idea, though Sarja remained somewhat doubtful. While Hackett slept, weak still from his loss of blood, Norman had the green man scratch on the metal floor as well as possible a crude map of the satellite's surface, and found that the city, where Fellows was, seemed some hundreds of miles back from the sea. While they talked, the sunlight, apparently sourceless, that came through the heavily barred windows of the room faded rapidly, and dusk settled over the great amphibian city beneath the giant dome, kept from total darkness by a silvery pervading light that Norman reflected must be the light from Earth's great sphere. With the dusk's coming the activities in the frog-city lessened greatly. With dusk, too, frog-guards entered the room bearing long metal troughs filled with a red jellylike substance, that they placed on racks along the wall. As the guards withdrew the men in the room rushed toward the troughs, elbowing each other aside and striking each other to scoop up and eat as much of the red jelly as possible. It was for all the world like the feeding of farm-animals, and Hackett and Norman so sickened at the sight that they had no heart to try the food. Sarja, though, had no such scruples and seemed to make a hearty meal at one of the troughs. After the meal the green men sought the bunks and soon were stretched in sonorous slumber. It was, Norman reflected, exactly the existence of domesticated animals—to eat and sleep and give food to their masters. A deeper horror of the frog-men shook him, and a deeper determination to escape them. He waited until all in the room were sleeping before beckoning to Sarja and Hackett. "Quiet now," he whispered to them. "If these others wake they'll make such a clamor we won't have a chance in the world. Ready, Sarja?" The green man nodded. "Yes, though I still think such a thing's impossible." "Probably is," Norman admitted. "But it's the one chance we've got, the immensely greater strength of our Earth-muscle that the frog-men must have forgotten when they put us in here." They moved silently to the room's great barred door, outside which a frog-guard paced. They waited until he had passed the door and on down the hall, then Norman and Hackett and Sarja grasped together one of the door's vertical bars. It was an inch and a half in thickness, of solid metal, and it seemed ridiculous that any men could bend it by the sheer strength of their muscles. Norman, though, was relying on the fact that on the second satellite, with its far lesser gravitational influence, their Earth-muscles gave them enormous strength. He grasped the bar, Hackett and Sarja gripping it below him, and then at a whispered word they pulled with all their force. The bar resisted and again, with sweat starting on their foreheads, they pulled. It gave a little. They shrank back from it as the guard returned, moving past. Then grasping the bar again they bent all their force once more upon it. Each effort saw it bending more, the opening in the door's bars widening. They gave a final great wrench and the bent bar squealed a little. They shrank back, appalled, but the guard had not heard or noticed. He moved past it on his return along the hall, and no sooner was past it than Norman squeezed through the opening and leaped silently for the great frog-man's back. It went down with a wild flurry of waving webbed paws and croaking cries, stilled almost instantly by Norman's terrific blows. There was silence then as Hackett and Sarja squeezed out after him, the momentary clamor of the battle having aroused no one. The three leaped together toward the stairs. In two great floating leaps they were on the floor above, Hackett and Norman dragging Sarja between them. They were not seen, were sailing in giant steps up another stair, hopes rising high. The last stair—the roof-opening above; and then from beneath a great croaking cry swelled instantly into chorus of a alarmed shouts. "They've found the door—the guard!" panted Hackett. They were bursting out onto the roof. Frog-guards were on it who came in a hopping rush toward them, force-pistols raised. But a giant leap took Hackett among them, to amaze them for a moment with great flailing blows. Sarja had leaped for the nearest flying-boat resting on the roof, and was calling in a frantic voice to Norman and Hackett. Norman was turning toward Hackett, the center of a wild combat, but the latter emerged from it for a brief second to motion him frantically back. "No use, Norman—get away—get away!" he cried hoarsely, frenziedly. "Hackett—for God's sake—!" Norman half-leaped to the other, but an arm caught him, pulled him desperately onto the boat's surface. It was Sarja, the long craft flying over the roof beneath his control. "They come!" he panted. "Too late now—" Frog-men were pouring up onto the roof from below. Sarja sent the craft rocketing upward, as Hackett gestured them away for a last frantic time before going down beneath the frog-men's onslaught. The roof and the combat on it dropped back and beneath them like a stone as their craft ripped across the silvery dusk over the mighty frog-city. They were shooting toward the city's center, toward the green pool that was the entrance to the water-tunnel, while behind and beneath an increasing clamor of alarm spread swiftly. Norman raged futilely. "Hackett—Hackett! We can't leave him—"
"Too late!" Sarja cried. "We cannot help him but only be captured again. We escape now and come back—come back—"
The truth of it pierced Norman's brain even in the wild moment. Hackett had fought and held back the frog-guards only that they might escape. He shouted suddenly. "Sarja—the water-tunnel!" A half-dozen boats with frog-guards on them were rising round it in answer to the alarm! "The force-gun!" cried the green man. "Beside you—!" Norman whirled, glimpsed the long tube on its swivel beside him, trained it on the boats rising ahead as they rocketed nearer. He fumbled frantically at a catch at the gun's rear, then felt a stream of shells flicking out of it. Two of the boats ahead vanished as the shells released their annihilating force, another sagged and fell. From the remaining three invisible force-shells flicked around them, but in an instant Sarja had whirled the boat through them and down into the water-tunnel! Norman clung desperately to his seat as the boat flashed down through the waters, and then, as Sarja sent it flying out through the great tunnel's waters, glimpsed, close behind, the beams of the three Rala boats as they pursued them through the tunnel, overtaking them. Could the force-shells be fired under water? Norman did not know, but desperately he swung the force-gun back as they rushed through the waters, and pressed the catch. An instant later beams and boats behind them in the tunnel vanished. His lungs were afire; it seemed that he must open them to the strangling water. The boat was ripping the waters at such tremendous speed that he felt himself being torn from his hold on it. Pain seemed poured like molten metal through his chest—he could hold out no longer; and then the boat stabbed up from the waters into clear air! Norman panted, sobbed. Behind them rose the colossal metal dome of the frog-city, gleaming dully in the silvery light that flooded the far-stretching seas. That light poured down from a stupendous silver crescent in the night skies. Norman saw dully the dark outlines on it before he remembered. Earth! He laughed a little hysterically. 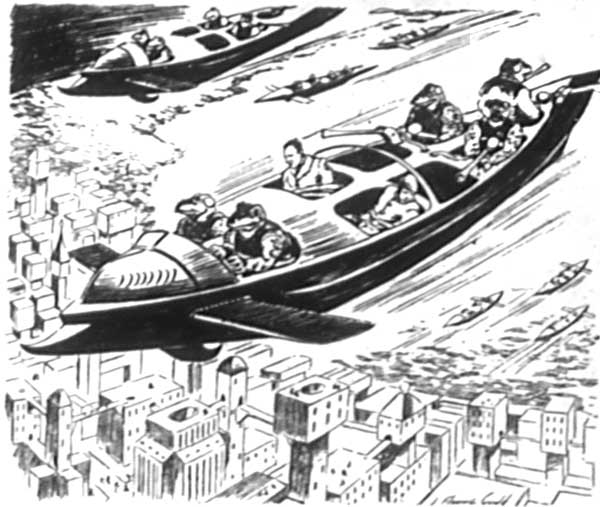 Sarja was driving the flying-boat out over the sea and away from the frog-city at enormous speed. At last he glanced back. Far behind them lay the great dome and up around it gleaming lights were pouring, lights of pursuing Rala boats. "We escape," Sarja cried, "the city of the Ralas, from which none ever before escaped!" Remembrance smote Norman. "Hackett! Held off those frog-men so we could get away—we'll come back for him, by God!" "We come back!" said Sarja. "We come back with all the green men of this world to the Ralas' city, yes! I know what Fallas has planned." "Can you find your way to him—to your city?" Norman asked. Sarja nodded, looking upward. "Before the next sun has come and gone we can reach it." The boat flew onward, and the great dome and the searching lights around it dropped beneath the horizon. Norman felt the warm wind drying his drenched garments as they rushed onward. Crouched on the boat he gazed up toward the silver crescent of Earth sinking toward the horizon ahead. That meant, he told himself, that the satellite turned slowly on its axis as it whirled around Earth. It came to him that its night and day periods must be highly irregular. When the sun climbed from the waters behind them they were flying still over a boundless waste of waters, but soon they sighted on the horizon ahead the thin green line of land. Sarja slowed as they reached it, took his bearings, and sent the craft flying onward. They passed over a green coastal plain and then over low hills joined in long chains and mantled by dense and mighty jungles, towering green growths of unfamiliar appearance to Norman. He thought he glimpsed, more than once, huge beastlike forms moving in them. He did see twice in the jungles great clearings where were fair-sized cities of bright-green buildings, a metal tower rising from each. But when he pointed to them Sarja shook his head. At last, as they passed over another range of hills and came into sight of a third green city with its looming tower, the other pointed, his face alight. "My city," he said. "Fallas there." Fellows! Norman's heart beat faster. They shot closer and lower and he saw that the buildings were obviously green to lend them a certain protective coloration similar to that of the green jungles around them. The tower with its surmounting cage puzzled him though, but before he could ask Sarja concerning it his answer came in a different way. A long metal tube poked slowly out of the cage on the tower's top and sent a hail of force-shells flicking around them. "They're firing on us!" Norman cried. "This can't be your city!" "They see our black boat!" Sarja exclaimed. "They think we're Rala raiders and unless we let them know they'll shoot us out of the air! Stand up—wave to them—!" Both Norman and Sarja sprang to their feet and waved wildly to those in the tower-cage, their flying-boat drifting slowly forward. Instantly the force-shells ceased to hail toward them, and as they moved nearer a sirenlike signal broke from the cage. At once scores of flying-boats like their own, but glittering metal instead of black, shot up from the city where they had lain until now, and surrounded them. As Sarja called in his own tongue to them the green men on the surrounding boats broke into resounding cries. They shot down toward the city, Norman gazing tensely. Great crowds of green men in their dark tunics had swarmed out into its streets with the passing of the alarm, and their craft and the others came to rest in an open square that was the juncture of several streets. The green men that crowded excitedly about Norman and Sarja gave way to a half-dozen hurrying into the square from the greatest of the buildings facing on it. All but one were green men like the others. But that one—the laughing-eyed tanned face—the worn brown clothing, the curious huge steps with which he came—Norman's heart leapt. "Great God—Norman!" The other's face was thunderstruck. "Norman—how by all that's holy did you get here?" Norman, mind and body strained to the breaking point, was incoherent. "We guessed how you'd gone—the second satellite, Fellows—Hackettand I came after you—taken to that frog-city—"
As Norman choked the tale, Fellows' face was a study. And when it was finished he swallowed, and gripped Norman's hand viselike. "And you and Hackett figured it out and came after me—took that risk? Crazy, both of you. Crazy—"
"Fellows, Hackett's still there, if he's alive! In the Rala city!" Fellows' voice was grim, quick. "We'll have him out. Norman, if he still lives. And living or dead, the Ralas will pay soon for this and for all they've done upon this world in ages. Their time nears—yes." He led Norman, excited throngs of the green men about them, into the great building from which he had emerged. There were big rooms inside, workshops and laboratories that Norman but vaguely glimpsed in passing. The room to which the other led him was one with a long metal couch. Norman stretched protestingly upon it at the other's bidding, drifted off almost at once into sleep. He woke to find the sunlight that had filled the room gone and replaced by the silvery Earth-light. From the window he saw that the silver-lit city outside now held tremendous activity, immense hordes of green men surging through it with masses of weapons and equipment, flying-boats pouring down out of the night from all directions. He turned as the door of the room clicked open behind him. It was his old friend Fellows. "I thought you'd be awake by now, Norman. Feeling fit?" "As though I'd slept a week," Norman said, and the other laughed his old care-free laugh. "You almost have, at that. Two days and nights you've slept, but it all adds up to hardly more than a dozen hours." "This world!" Norman's voice held all his incredulity. "To think that we should be on it—a second satellite of Earth's—it seems almost beyond belief." Sometimes it seems so to me, too," Fellows said thoughtfully. "But it's not a bad world—not the human part of it, at least. When this satellite's atmosphere caught me and pitchforked me down among these green men, smashing the plane and almost myself, they took care of me. You say three others vanished as I did? I never heard of them here; they must have crashed into the sea or jungles. Of course, I'd have got back to Earth on one of these flying-boats if I'd been able, but their molecular power won't take them far from this world's surface, so I couldn't. "As it was, the green men cared for me, and when I found how those frog-men have dominated this world for ages, how that city of the Ralas has spread endless terror among the humans here, I resolved to smash those monsters whatever I did. I taught some of the green men like Sarja my own speech, later learning theirs, and in the weeks I've been here I've been working out a way to smash the Ralas. "You know that amphibian city is almost impregnable because humans can hardly live long enough under the water to get into it, let alone fight under water as the frog-men can. To meet them on even terms the green men needed diving-helmets with an oxygen supply. They'd never heard of such an idea, too afraid of the sea ever to experiment in it, but I convinced them and they've made enough helmets for all their forces. In them they can meet the Ralas under water on equal terms. "And there's a chance we can destroy that whole Rala city with their help. It's built on a giant pedestal of rock rising from the sea's floor, as you saw, and I've had some of the green men make huge force-shells or force-bombs that ought to be powerful enough to split that pedestal beneath the city. If we can get a chance to place those bombs it may smash the frog-men forever on this world. But one thing is sure: we're going to get Hackett out if he still lives!" "Then you're, going to attack the Rala city now?" Norman cried. Fellows nodded grimly. "While you have slept all the forces of the green men on this world have been gathering. Your coming has only precipitated our plans, Norman—the whole soul of the green races has been set upon this attack for weeks!" Norman, half bewildered at the swiftness with which events rushed upon him, found himself striding with Fellows in great steps out through the building into the great square. It was shadowed now by mass on mass of flying-boats, crowded with green men, that hung over it and over the streets. One boat, Sarja at its controls, waited on the ground and as they entered and buckled themselves into the seats the craft drove up to hang with the others. A shattering cheer greeted them. Norman saw that in the silvery light of Earth's great crescent there stretched over the city and surrounding jungle now a veritable plain of flying-boats. On each were green men and each bristled with force-guns, and had as many great goggled helmets fastened to it as it had occupants. He glimpsed larger boats loaded with huge metal cylinders—the force-bombs Fellows had mentioned. Fellows rose and spoke briefly in a clear voice to the assembled green men on their craft, and another great shout roared from them, and from these who watched in the city below. Then as he spoke a word, Sarja sent their craft flying out over the city, and the great mass of boats, fully a thousand in number, were hurtling in a compact column after them. Fellows leaned to Norman as the great column of purring craft shot on over the silver-lit jungles. "We'll make straight for the Rala city and try setting into it before they understand what's happening." "Won't they have guards out?" "Probably, but we can beat them back into the city before their whole forces can come out on us. That's the only way in which we can get inside and reach Hackett. And while we're attacking the force-bombs can be placed, though I don't rely too much on them." "If the attack only succeeds in getting us inside," Norman said, grim-lipped, "we'll have a chance—"
"It's on the knees of the gods. These green men are doing an unprecedented thing in attacking the Ralas, the masters of this world, remember. But they've got ages of oppression to avenge; they'll fight." The fleet flew on, hills and rivers a silver-lit panorama unreeling beneath them. Earth's crescent sank behind them, and by the time they flashed out over the great fresh-water sea, the sun was rising like a flaming eye from behind it. Land sank from sight behind and the green men were silent, tense, as they saw stretching beneath only the gray waters that for ages had been the base of the dread frog-men. But still the fleet's column raced on. At last the column slowed. Far ahead the merest bulge broke the level line where sky and waters met. The amphibian city of the Ralas! At Fellows' order-the flying-boats sank downward until they moved just above the waters. Another order made the green hosts don the grotesque helmets. Norman found that while cumbersome their oxygen supply was unfailing. They shot on again at highest speed, but as the gigantic black dome of the frog-city grew in their vision there darted up from around it suddenly a far-flung swarm of black spots. The muffled exclamation was Fellows'. There needed now no order on his part, though. Like hawks, leaping for prey, the fleet of the green men sprang through the air. Norman, clutching the force-gun between his knees, had time only to see that the Rala craft were a few hundred in number and that, contemptuous of the greater odds that favored these humans they had so long oppressed, they were flying straight to meet them. Then the two fleets met—and were spinning side by side above the waters. Norman saw the thing only as a wild whirl of Rala boats toward and beside them, great green frog-men crowding the craft, their force-guns hailing shells. Automatically, with the old air-fighting instinct, his fingers had pressed the catch of the gun between his knees and as its shells flicked toward the rushing boats he saw areas of nothingness opening suddenly in their mass, shells striking and exploding in annihilating invisibility there and in their own fleet. The two fleets mingled and merged momentarily, the battle becoming a thing of madness, a huge whirl of black and glittering flying-boats together, striking shells exploding nothingness about them. The Ralas were fighting like demons. The merged, terrific combat lasted but moments; could last but moments. Norman, his gun's magazine empty, seemed to see the mass of struggling ships splittering, diverging; then saw that the black craft were dropping, plummeting downward toward the waves! The Ralas, stunned by that minute of terrific combat, were fleeing. Muffled cries and cheers came from about him as the glittering flying-boats of the green men shot after them. They crashed down into the waters and curved deeply into their green-depths, toward the gigantic dome. Ahead the Rala boats were in flight toward their city, and now their pursuers were like sharks striking after them. There in the depths the force-guns of black and glittering boats alike were spitting, and giant waves and underwater convulsions rocked pursued and pursuers as the exploding shells annihilated boats and water about them. The tunnel! Its round opening yawned in the looming wall ahead, and Norman saw the Rala craft, reduced to scores in number, hurtling into it, to rouse all the forces of the great amphibian city. Their own boats were flashing into the opening after them. He glimpsed as he glanced back for a moment the larger craft with the great force-bombs veering aside behind them. It was nightmare in the water-tunnel. Flashing beams of the craft ahead and waters that rocked and smashed around them as in flight the Ralas still rained back force-shells toward them in a chaos of action. Once the frog-men turned to hold them back in the tunnel, but by sheer weight the rushing ships of the green men crashed them onward. Boats were going into nothingness all around them. A part of Norman's brain wondered calmly why they survived even while another part kept his gun again working, with refilled magazine. Fellows and Sarja were grotesque shapes beside him. Abruptly the tunnel curved upward and as they flashed up after the remaining Rala craft their boats ripped up into clear air! They were beneath the giant dome! But already Sarja had sent their craft whirling across the city toward the structure, half their fleet behind it, with part still emerging from the water-tunnel. Rala boats rose before them, but nothing could stop them now, their force-shells raining ahead to clear a path for their meteor-flight. They shot down toward the block-structure, and Norman, half-crazed by now, saw that to descend and enter was suicide in the face of the frog-forces rising now over all the city. He cried to Fellows, and with two of the guns as they swooped lower they sprayed force-shells along the building's side. The shells struck and whiffed away the whole side, exposing the level on the building's interior. Out from it rushed swarms of crazed green men, sweeping aside the frog-men guards, while far over the city the invading craft were loosing shells on the block-like buildings that held the prisoners, tens of thousands of them swarming forth. In the throng below as they raced madly forth Norman saw one, and shouted wildly. The one brown garbed figure looked up, saw their boat swooping lower, and leaped for it in a tremendous forty-foot spring that brought his fingers to its edge. Norman pulled him frenziedly up. "Norman!" he babbled. "In God's name—Fellows—!" "That helmet, Hackett!" Fellows flung at him. "My God, look at those prisoners—Norman!" The countless thousands of green men released from the buildings whose walls had vanished under the shells of the invaders had poured forth to make the amphibian city a chaos of madness. Oblivious to all else they were throwing themselves upon the city's crowding frog-men in a battle whose ferocity was beyond belief, disregarding all else in this supreme chance to wreak vengeance on the monstrous beings who had fed upon their blood. In the incredible insanity of that raging fury the craft of the green men hanging over the city were all but forgotten. Suddenly the city and the mighty dome over it quivered violently, and then again. There came from beneath a dull, vast, grinding roar. "The great force-bombs!" Fellows screamed. "They've set them off—the city's sinking—out of here, for the love of God!" The boat whirled beneath Sarja's hands toward the pool of the water-tunnel, all their fleet rushing with them. The grinding roar was louder, terrible; dome and city were shaking violently now; but in the insensate fury of their struggle the frog-men and their released prisoners were hardly aware of it. The whole great dome seemed sinking upon them and the city falling beneath it as Sarja's craft ripped down into the tunnel's waters, and then out, at awful speed, as the great tunnel's walls swayed and sank around them! They shot out into the green depths from it to hear a dull, colossal crashing through the waters from behind as the great pedestal of rock on which the city had stood, shattered by the huge force-bombs, collapsed. And as their boats flashed up into the open air they saw that the huge dome of the city of the Ralas was gone. Beneath them was only a titanic whirlpool of foaming waters in which only the curved top of the settling dome was visible for a moment as it sank slowly and ponderously downward, with a roar as of the roar of falling worlds. Buckling, collapsing, sinking, it vanished in the foam-wild sea with all the frog-men who for ages had ruled the second satellite, and with all those prisoners who had at the last dragged them down with them to death! Ripping off their helmets, with all the green men shouting crazily about them, Norman and Fellows and Hackett stared down at the colossal maelstrom in the waters that was the tomb of the masters of a world. Earth's great gray ball was overhead again and the sun was sinking again to the horizon when the three soared upward in the long, gleaming plane, its motor roaring. Norman, with Hackett and Fellows crowding the narrow cabin beside him, waved with them through its windows. For all around them were rising the flying-boats of the green men. They were waving wildly, shouting their farewells, Sarja's tall figure erect at the prow of one. Insistent they had been that the three should stay, the three through whom the monstrous age-old tyranny of the frog-men had been lifted, but Earth-sickness was on them, and they had flown to where the plane lay still unharmed among the reeds, a hundred willing hands dragging it forth for the take-off. The plane soared higher, motor thundering, and they saw the flying-boats sinking back from around them. They caught the wave of Sarja's hand still from the highest, and then that, too, was gone. Upward they flew toward the great gray sphere, their eyes on the dark outlines of its continents and on one continent. Higher—higher—green land and gray tea receding beneath them; Hackett and Fellows intent and eager as Norman kept the plane rising. The satellite lay, a greenish globe, under them. And as they went higher still a rushing sound came louder to their ears. "The edge of the satellite's atmosphere?" Fellows asked, as Norman nodded. "We're almost to it—here we go!" As he shot the plane higher, great forces smote it, gray Earth and green satellite and yellow sun gyrating round it as it reeled and plunged. Then suddenly it was falling steadily, gray Earth and its dark continent now beneath, while with a dwindling rushing roar its second satellite whirled away above them, passing and vanishing. Passing as though, to Norman it seemed, all their strange sojourn on it were passing; the frog-men and their mighty city, Sarja and their mad flight, the green men and the last terrific battle; all whirling away—whirling away. The famous experiment which proves that the "earth do move" by letting the observer actually see it twisting underneath his feet, an experiment invented by the French mathematician Jean B. L. Foucault nearly a century ago was repeated recently under unusually impressive circumstances before an international scientific congress at Florence, Italy, the same city where Galileo once was persecuted for holding the same opinion. From the center of the dome of the Church of Santa Maria di Fiore, Father Guido Alfani, director of the Astronomical Observatory, suspended a 200-pound weight on a wire 150 feet long. On the bottom of this weight was a tiny projecting point which traced a line on a table-top sprinkled with sand, as the great pendulum swung slowly back and forth. At a given signal Father Alfani set the pendulum to swinging. While the assembled scientists watched it, slowly the line traced across the sand table-top changed direction. As Foucault proved long ago and as the watching scientists well knew, the table was being twisted underneath the pendulum by the rotation of the earth. A new airplane propeller has recently been patented by J. Kalmanson of Brooklyn, N. Y. Greater speed and marked saving in fuel is claimed for the invention, which may be attached to any type of airplane. The device is in two parts, which may be used separately as front and rear propellers or combined into a single blade. The principle is that the front one acts to bring air to the other, giving the propeller more of a hold, so to speak, and greater power. This is accomplished by four air-spoons, one on each side of each blade of the propeller. It is said that the device can double the speed of an airplane and raise it from the ground in ninety feet instead of the 200 feet most airplanes now require. It is also claimed that the new propeller will prevent the plane from making a nose drive unless the pilot forces it to do so, and enable it to make a safe landing within a short distance. Because of the increase in power and speed, the device would save a large amount of gasoline and oil, as well as guarding the motor from part of the strain on it. The device is said to be also applicable to ships, the same principle operating in water as well as air. _Source: Astounding Stories of Super Science, August 1930, 175-191. This story is believed to have passed into the public domain when the copyright for Astounding failed to be renewed as required under the 1976 copyright act.